Usually when Ramadhan rolls around I'd already be thinking about shopping for outfits for the celebratory month of Syawal, but living part-time in two cities and the resulting exhaustion from having to travel constantly between three cities (we still have to occasionally visit Shah's hometown after all) kind of take the fun out of planning Syawal fashion, though. 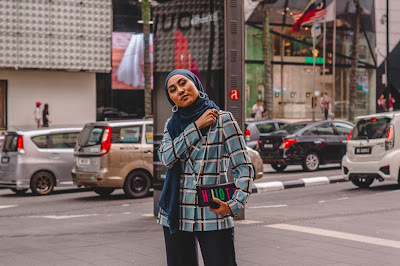 Thankfully I already have an outfit for the morning of Eid (fyi also the first day of Syawal) that I bought a looong time ago though, so that's one less unticked things on my Eid To-Do List! I'm used to getting a few other modest outfits to wear for when I attend the inevitable Eid "open houses" a.k.a. THE BEST PART of the month of Syawal, what with all the Eid food and the fun of hanging out with family and friends! 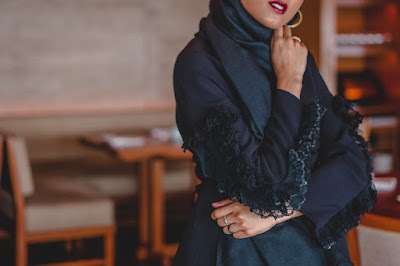 Unfortunately, I just don't think it's possible to find time in between my travels to do that much Eid shopping so I'll just have to rely on whatever is already in my closet, including this modest black pleated dress. Extra read: What is an "open house"? 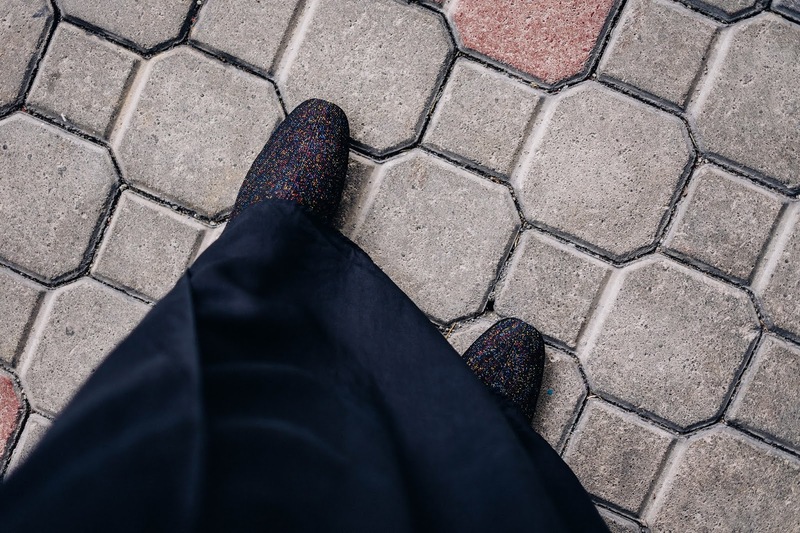 Generally, Malaysians wear modest outfits when attending Malay weddings and open houses, and more often than not the outfits worn to those events are interchangeable. 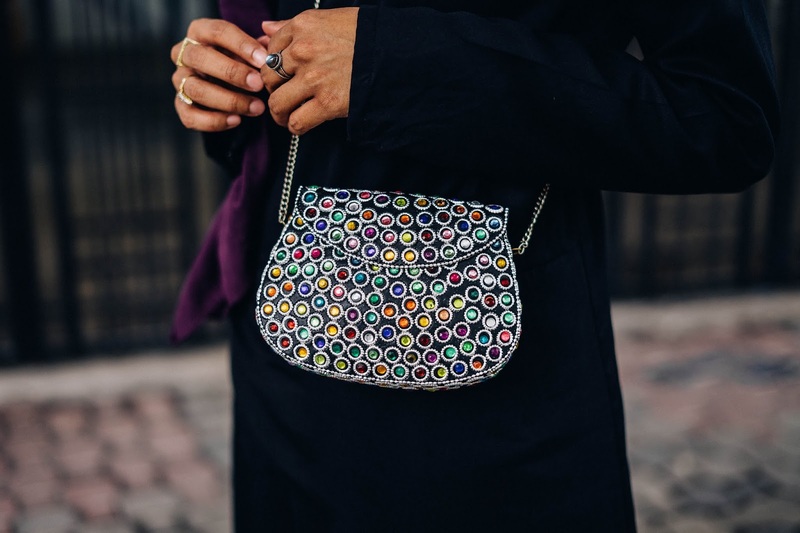 I wore this black dress with a gorgeous bejeweled bag (really, isn't it gorgeous?) bought in Dubai's Textile Souk, paired with these rainbow glittery boots to a friend's wedding, but I can see myself wearing this getup while attending a future open house. But perhaps sans the glittery boots though; it's just easier to wear shoes that are easy to slip on and off as, after all, it is customary here to take off your shoes before entering one's house! PS: Read the dramatic story of how I came to own this black pleated dress. 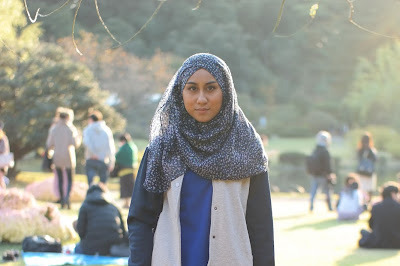 PPS: Explore the hashtag #ModestyIsPriority on Instagram to see more of my modest outfits! I learned do much bh reading the "extra" about the celebration lf Ramadan and Eid in Malaysia. I would have to agree that any additional opportunities to eat, celebrate and meet new people must be taken advantage of!! I also read the story of your dismay over luggage that was a left behind. I remember that story and I'm impressed with your maturity and positive attitude. Sadly Shah and I don't get to be at home around our family and friends much these days, so the fact that we pretty much celebrate Eid for a whole entire month (even though it is only officially on the first day of the month of Syawal) is definitely something we WILL take advantage of! Good golly that bag is a beauty! How elegant and stunning you look Liyana... the epitome of dignity and grace. I have been wanting to ask you what you think of the new H&M modest range? It seems to be causing a stir and confused me a little as there are bare legs (albeit the bottom bit) and bare forearms. I'd love your thoughts on it! Enjoy Eid, when it comes, I'm sure you have plenty (read: LOADS!!) of outfit options... especially with your creativity! Thank you SO MUCH for your kind compliments, Samantha <3 I will definitely enjoy Eid (and Eid fashion) as maximum as I could! Regarding the H&M modest range, if I were allowed only one word to describe it, it would probably be: "Eh." If I'm not mistaken, it is their very first modest range, but I find it incredibly underwhelming. I honestly don't feel attracted to any piece in the collection. The prints look odd and old-fashioned (especially the sheeny ones) and the designs are nothing exciting. As a modest hijabi who loves clothes, who is a fan of H&M, I don't think they got it right. Neither did Dolce & Gabbana when they released their modest collection a couple of years ago. These all just make me wonder if they have a specific tiny group of target audience (that does not include me, or my family, or friends), or perhaps they didn't consult the right people or did the correct studies on their market before rolling out an entire collection (albeit a small one). 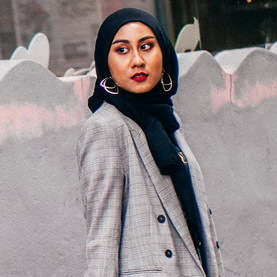 Muslims are encouraged to dress modestly - both women AND men - and while some Muslim women don't opt for the hijab, some of them still choose to dress modest (and some choose to wear whatever the heck they want, like I did before becoming a hijabi, which is still our choice to make), so it's not unusual to see bare forearms and lower legs. That being said, even though I could still find a lot of modest options in regular H&M collections, I would actually love to see a modest collection that's truly exciting and versatile. One that's not marketed just to Muslims, but to Jewish and Christians and anyone of any religion or religion-less peeps who choose to dress modestly - or for those who just feel like dressing up a little extra modest on certain days or to certain events. Fill up the collection with amazing flowy dresses and pretty maxi skirts and cool long-sleeved tops/outerwears. Oh dear it's like I've written an entire post for my reply. I feel the need to apologise for it, I'm sorry Samantha! hahhaaha, hi liyana, I read both your blog post and your wonderful essay comment. I guess, that's how much I enjoy reading you. 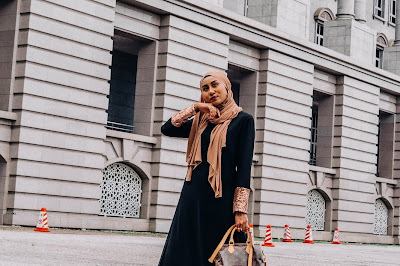 You are so very interesting and enthusiastic and I like how you keep it versatile and down-to-earth for the Eid open house wear considering all of the juggling you do and the travels. And can I say that you are absolutely glowing here in these photos? It's not something I would wear personally but you made it so elegant with the choice of hijab, bag and shoes. =) Happy Ramadhan! Shanaz, you always leave me the sweetest comments, and truthfully sometimes I feel like I don't deserve them all. But I truly appreciate the love - a hundred percent. You're one of the reasons I keep on doing this blogging thing, so thank you thank you THANK YOU, I can't thank you enough. I remember I had a good foundation day on this day! My skin has been breaking out badly for months - I get painful huge bumps around my cheeks and lower part of the face - but thankfully has now calmed down, but I have been relying on good foundations and concealer for occasions like this, so I can't take credit for the glow I'm afraid! By the way, you would look GORGEOUS in a shorter version of this dress.